Apple Carplay : everything you need to know! If your Car has an inbuilt software equipped dock(touch screen), it usually runs good and functional, up until Car's not aged up! As new Car's always come up with newer, enhanced software & older Car's are left with old outdated software! Carplay changes that, as now simply connect your iPhone via lightning cable to your Dock, then simply click on Carplay icon(Which will show up if you car is supported), That's it!. CarPlay is not an in-car system that runs iOS or any of it's apps, in turn It's a system that integrates your iPhone's basic UI or basic apps with your car's digital system, allowing you to control few features on your car more efficiently. However, Apple plans to allow third parties to build CarPlay compatibility into their apps, making them usable through their system. What happens when you plug in your iPhone to your Car's Dock? Carplay takes the things you want to do with your iPhone, while driving and puts them in your Car's dock ( Built in display), so those functions are easily accessible, without installing any software or any app on your Car, as manufacturers have to make improvements regarding to Apple's Carplay. What are the basic things you can do ? Things like getting directions, making calls, sending & receiving messages, listening to music, all in way that allows you to stay focused on the road, without ever letting your hands off the steering wheel, as each of those functions mentioned above can be accessed via Siri, handsfree effortlessly! This part, let's you use Carplay with the help of Siri, simply press and hold the voice button on the steering wheel, and ask anything you want, like play music or call someone. If your Car has a touchscreen dock, you can simply access any supported apps & feel yourselves home, as its the same user interface that you're familiar with, ie.iPhone. You can also navigate through the system, with the help of the knobs like moving up/down, left/right etc. How many apps supported ? Apple's native Maps App( with all turn by turn directions, traffic conditions & estimated time to reach a particular destination), Phone Dailer App (Simply ask Siri to call any contact, from your phone without picking up your phone), Messages App( send, recieve, read messages with Siri, without ever letting you view off the roads! ), Music App (Ask Siri to play any song ), many apps have been added to carplay over time as now Spotify, podcasts, iheartradio, beats music, stitcher,overcast & many more. 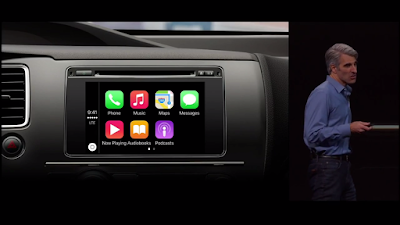 Ohh & Also make notes, as the new "Apple Music" would soon be making its top notch spot on Carplay ! Is your iPhone compatible with CarPlay? Seems like all iPhones from iPhone 5 and above are already supported with Carplay, Some say that it's the lightning port that makes it compatible, but then what about Ipod touch 5 ? So just keep in mind, hardware requirements are also necessary. 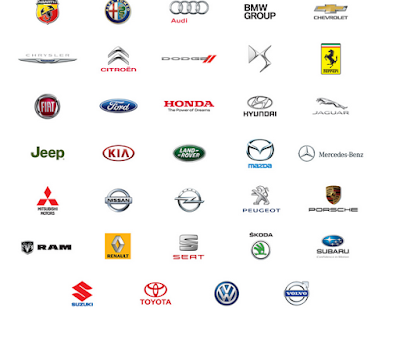 Which Car manufacturers support Carplay ? Quicknote : Keep in mind you have to upgrade your existing dock, as simply plugging in your iPhone won't turn on Carplay! These were basically the features introduced last year, particularly from march 2014.But Apple at WWDC 2015 gave us an small, but rather an huge update that's going to change the way we use a Iot of things in our car. This is really going to be huge for both Car makers and consumers in terms of reliability. Craig federighi announced that now car makers can add their own functions into carplay, as some important features like security cameras, controlling car's temperature, central lock system depends on car's inbuilt software ! Now you will be able to control this through Carplay. This will be done after the Global release of iOS 9 as they've incorporated those newer features in the latest release of iOS, as that's what in-turn docks in your Car, while using Carplay! At the moment you have to switch from Carplay to Car's basic interface to change car's temperature. But After the iOS9 release Users can relax and this in-turn will help automotive makers too. Just consider how fast updates can be provided to these systems. Apple is also adding support for different display sizes. Spoiler : Homekit could also be implemented here, maybe asking Siri to set the car's temperature to a cool environment could be a pleasure after a hot day outside. Apple even claimed that now you no longer need to be connected via a lightning cable. As in future cars you will be connected automatically to Carplay the moment you step into your Car. Imagine getting into your car & simply asking Siri to play your music(also whole Carplay experience), without pulling your phone out of your pocket(Which hopefully translates that Wifi/bluetooth would be used) ! Carplay is really going to be huge in future. Does Apple have any rival in this Space ? Well it's Simple, if Apple's in a thing or so, Google's got to be there! It also goes the Otherway around, no offense ! Well Everyone needs to enjoy every feature regardless of the ecosystem they live in, right ? Google has Android Auto to safely backup all of its android user base, upon Apple's Carplay. Both of them provide similar features. But now Apple has an edge due the above improvements.